When a game is in its infancy, a lot of ideas get kicked around. 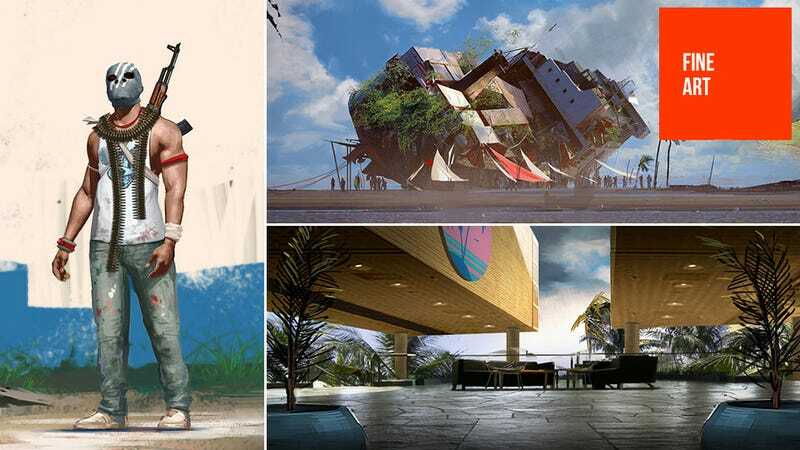 Here are some from the very earliest stages of Far Cry 3 development, when the team had settled on a tropical island setting and... little else. While we can see some areas and ideas that made it into the final game, like the rusting ship hulls, as you can see there's a lot of crazy stuff that didn't make it, like luxury resorts, golf courses, dome towns, old Soviet helicopters and even a run-down fun park. What's interesting is the change in tone evident; the final game has a very "run with the natives" feel, while this art has more of a "the rich people have cut and run" look. It's almost post-apocalyptic. The images are all from the talented folks at West Studio, a firm specialising in concept art for the video game and film industries. Outside of Far Cry 3, they've also worked on games like the recent Twisted Metal reboot, Modern Warfare 2 and Medal of Honor.